Hemika's Blog: View Hazelcast Management Center for WSO2 Message Broker 3.0.0. View Hazelcast Management Center for WSO2 Message Broker 3.0.0. WSO2 products allows to use multiple instances to form a cluster and divide up the work to enhance the performance and reliability of their intended processes. WSO2 Message Broker 3.0.0 uses Hazelcast to communicate within the instances of a cluster and is heavily depended on on it when it comes message delivering scenarios and etc. The following post is on how to access the hazelcast management center of the Message Broker(s). 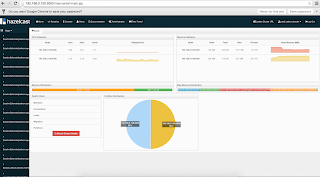 The hazelcast management center helps to monitor the overall state of the cluster. A WSO2 Message Broker cluster(clustering enabled). Tomcat to host hazelcast management center. First we have to modify the axis2.xml file of all the instances. Access the "axis2.xml" file in the following path. At the bottom of the file in the "clustering" section, the following commented line can be seen. Uncomment the line and modify the port to 8080. This is the default port in tomcat which we will get back later. Startup the Message Broker instance(s) afterwards. Now lets host the hazelcast management center. Download Hazelcast - The war file is included. After downloading, place the "mancenter-3.2.6.war" file in the "<TOMCAT_HOME>/webapps" folder and rename the war file to "mancenter.war". Start up the tomcat server using "./startup.sh" in the "bin" folder of tomcat. Login to the hazelcast management center using username and password as "admin" and "admin". Once logged in, you should see the hazelcast management center. Following are several images of the hazelcast management center. This mentioned solution should also work with other WSO2 products which uses hazelcast for clustering. But I have not tested them out. I do not guarantee this solution will work or held responsible.